Rayyasree is now sponsored! Thank you so much! There are many other families waiting for a sponsor. You can learn more about them on our ‘Sponsor a Family’ webpage. Our family this month is a 16 year old girl, Ramyasree, and her grandmother. Ramyasree has known much sorrow in her short life. Her father died several years ago, leaving her mother to support Ramyasree and her two siblings. One sister did marry but into a family in a distant village. Tragically, her brother then died from a viral fever during his studies in engineering. Her mother, grief-stricken, died soon after. With the encouragement of the Canossian sisters, Ramyasree recovered sufficiently from these terrible losses to return to school in a competitive computer science program that she had been admitted to. She now lives with her grandmother but they have little money for food and to keep Ramyasree in school. She and her grandmother are hoping to start a small business to help them survive and keep Ramyasree in school. 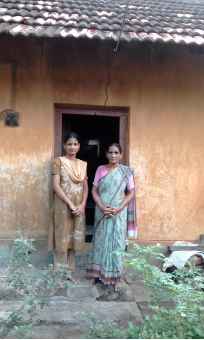 Ramyasree and her grandmother live in Andhra Pradesh. To learn more about our sponsorship program in Andhra Pradesh, please click here. If you would like to sponsor Ramyasree, it would be an answer to their prayers. To learn more about Ramyasree and sponsor her, please click here.